Professor and writer on Roman law; born in Breslau Sept. 16, 1848. His original name was Cohn, which he exchanged for Conrat in 1882, when he embraced the Christian faith. Conrat attended the gymnasium of St. Maria Magdalena in Breslau up to the year 1867; and then entered successively the universities of Breslau, Heidelberg, and Berlin. At the last he took his doctor's degree in 1870. 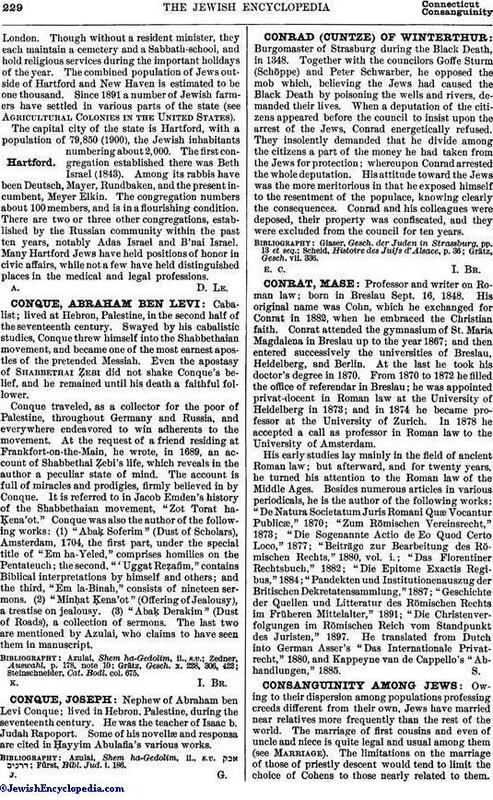 From 1870 to 1872 he filled the office of referendar in Breslau; he was appointed privat-docent in Roman law at the University of Heidelberg in 1873; and in 1874 he became professor at the University of Zurich. In 1878 he accepted a call as professor in Roman law to the University of Amsterdam. His early studies lay mainly in the field of ancient Roman law; but afterward, and for twenty years, he turned his attention to the Roman law of the Middle Ages. Besides numerous articles in various periodicals, he is the author of the following works: "De Natura Societatum Juris Romani Quæ Vocantur Publicæ," 1870; "Zum Römischen Vereinsrecht," 1873; "Die Sogenannte Actio de Eo Quod Certo Loco," 1877; "Beiträge zur Bearbeitung des Römischen Rechts," 1880, vol. i.; "Das Florentiner Rechtsbuch," 1882; "Die Epitome Exactis Regibus," 1884; "Pandekten und Institutionenauszug der Britischen Dekretatensammlung," 1887; "Geschichte der Quellen und Litteratur des Römischen Rechts im Früheren Mittelalter," 1891; "Die Christenverfolgungen im Römischen Reich vom Standpunkt des Juristen," 1897. He translated from Dutch into German Asser's "Das Internationale Privatrecht," 1880, and Kappeyne van de Cappello's "Abhandlungen," 1895.